Figi's® 7 Favorites Gift Box. 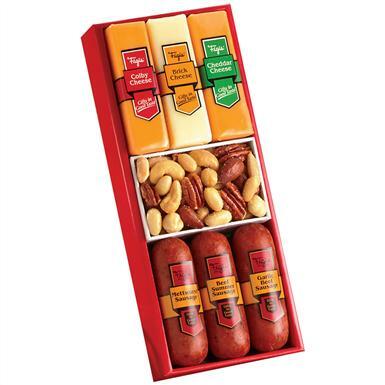 A cheese, meat and nut lover's favorite. A taste-tempting gift. Mini Grade A dairyland cheeses, including colby, cheddar and brick cheese, along with smokehouse sausages, including garlic, mettwurst and summer flavors. Roasted mixed nuts with peanuts top off this amazingly delicious ensemble. 13 ozs.